The name is Firley, I carry an iPhone. I have now taken 11,259 pictures with my iPhones, most of them with my current iPhone. Of the 11,259 pictures, less than 200 are cute cat pictures. There is one selfie taken as a proof of concept. It failed. Most are furniture pictures. I have close to 7,000 tucked safely away on Flickr. 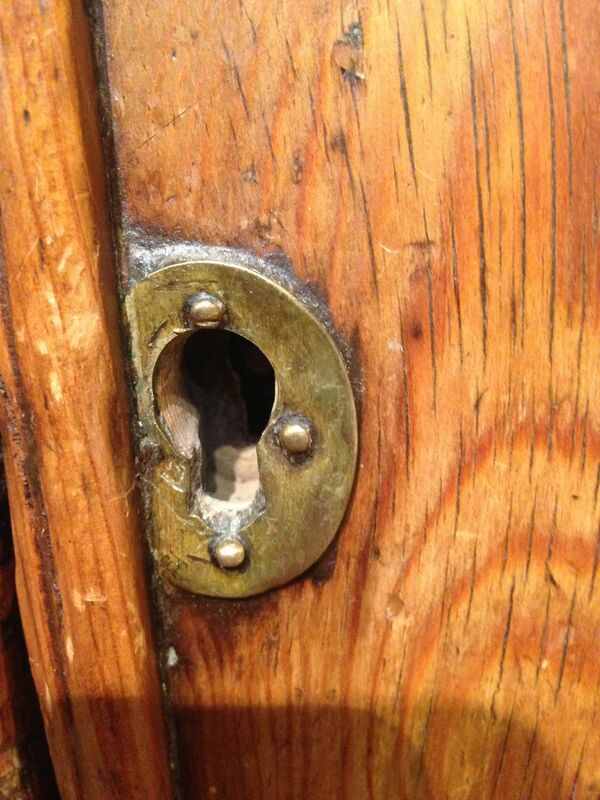 From those, I have selected 138 pictures of hardware, knobs, bails, hinges and locks among others. I have chosen to share them with you, my loyal followers. Noblesse oblige. So, without any further blathering, I present my hardware pictures. Click on either picture to go to the set on Flickr. Not Your Average Clearance Sale. The local high-end auction house has occasional auctions to clear out unsold inventory and other pieces that don’t fit into one of their estate or catalog sales. It’s mostly good stuff, it just doesn’t have a central theme or fit in with the exceptional pieces they have in their catalog auctions. Last Saturday they had one of these auctions. Feeling the need to do something different, I went to the preview of this auction and took some pictures. I’ve already gotten four posts out of it. Time to show all the pictures move on. If you’re in a hurry, you can look at the set HERE. One of the first pieces to catch my eye was this table. Click on the pictures to see larger images. A nice simple table. I think it’s Shaker. I always have questions about construction details. I had time and a camera so I took a picture. Actually a lot of pictures. It’s a bit hit or miss taking pictures of the underside of a table in a dark room. This was the best one. 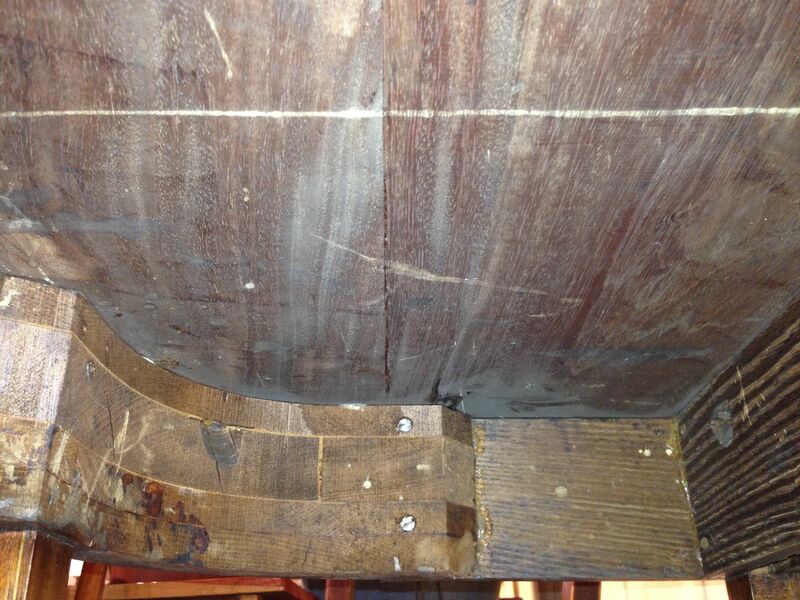 Underside of the table. Note the brick laid curved apron. Click to enlarge. 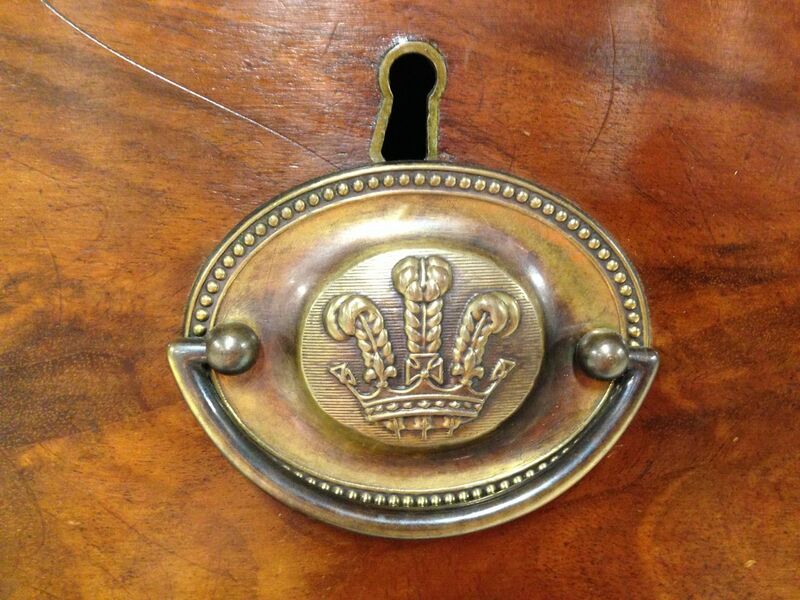 Although I am not a fan of rococo revival/bombe furniture, this chest was interesting to study. 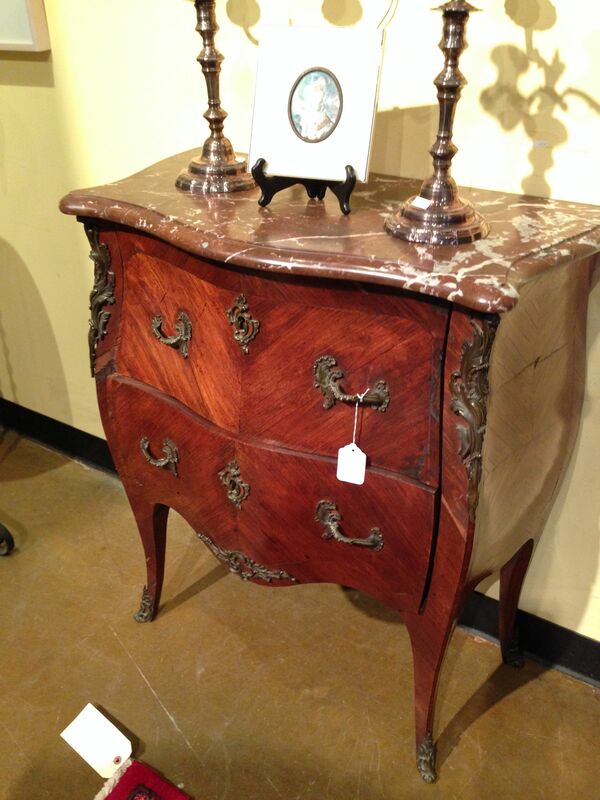 Rococo revival/bombe chest. Don’t love it. I know the front of the drawer is not dovetailed but how about the back? 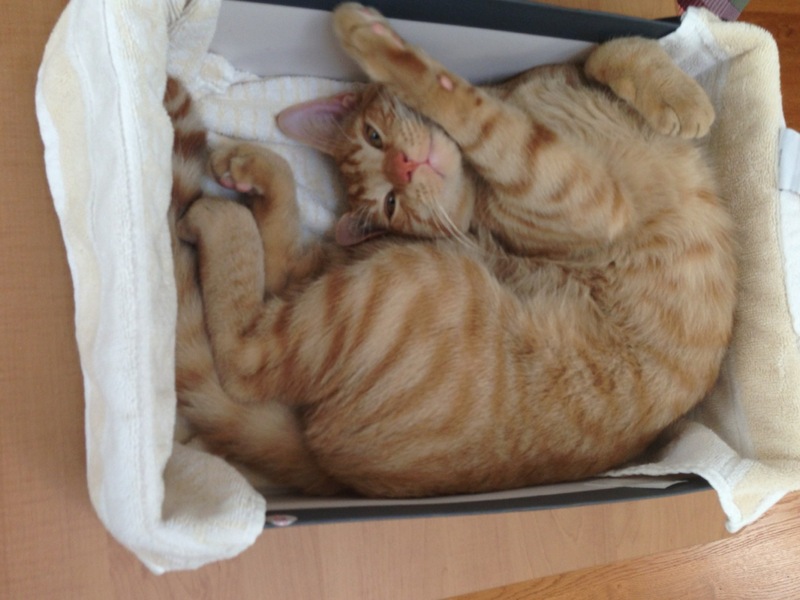 The drawer just fell out. Honest. The back is dovetailed and deserves a closer look. Half missing dovetails. Any explanations? Still don’t love bombe furniture. There is a picture of the case interior in the Flickr set. For your last chance to see all 79 pictures in the Flickr set, click HERE. 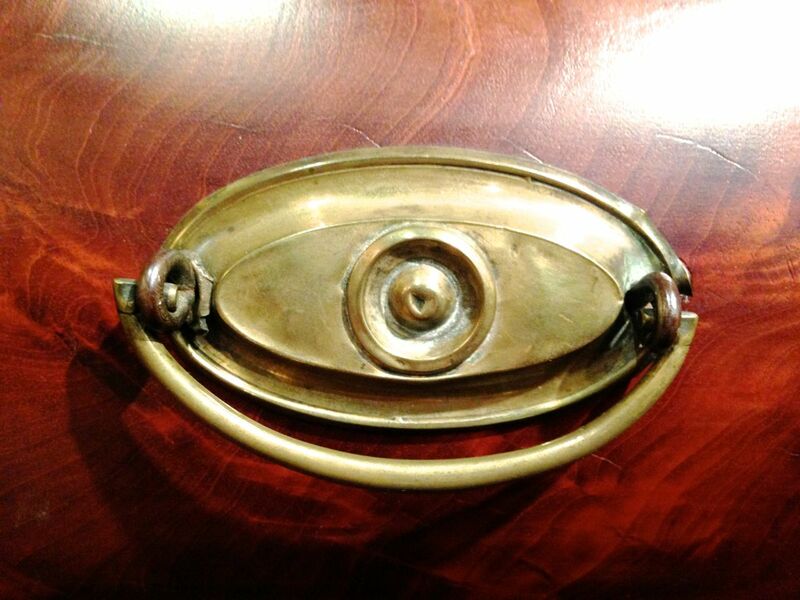 In my last blog, Bodged or Botched, I pointed out the efforts made to mount a bail pull on a very thick drawer front. I’ll wait while you go back and look. 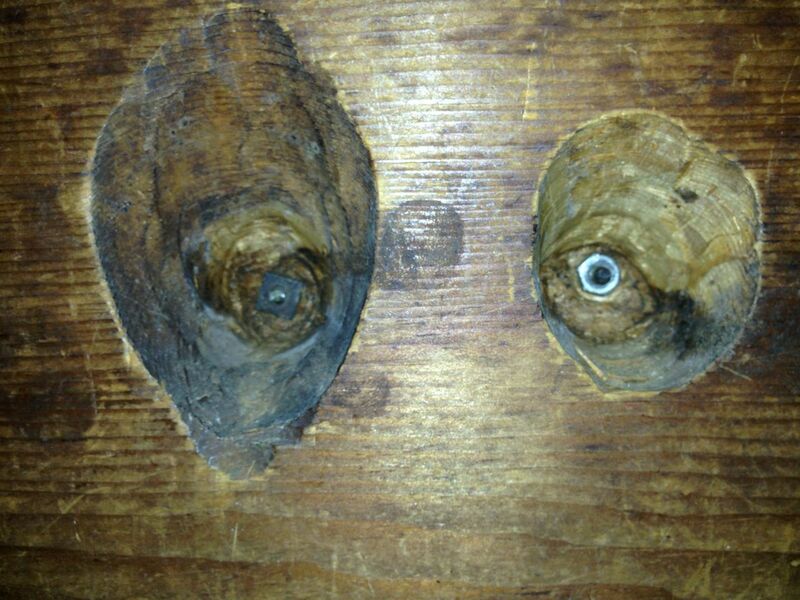 The installation of the posts (eyebolts in this case) on the first pull is quite common, and has been for hundreds of years. It is called counterboring and is the technically correct way to install all posts. 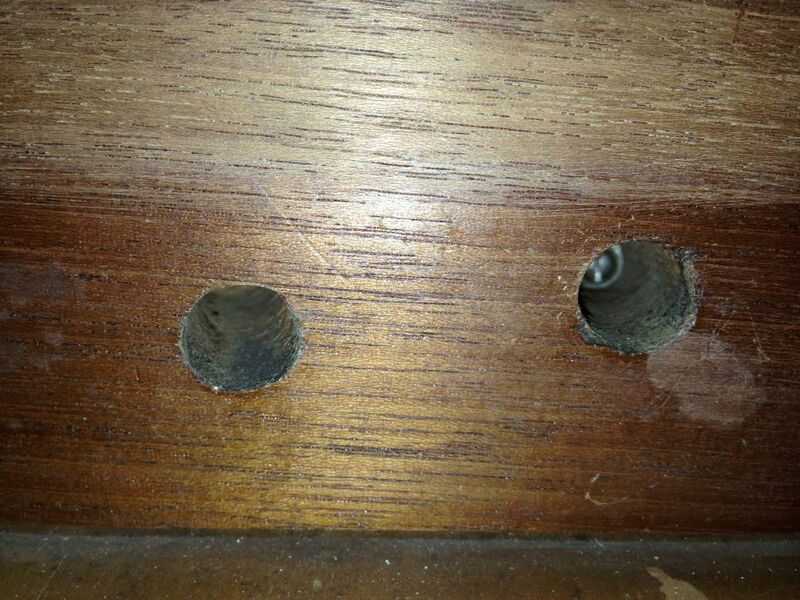 Nowadays most people just let the posts stick out on the inside of the drawers-but they should be cut below flush and counterbored. A post with a machine screw fitting would be an easier, if not period correct, approach. And if anybody knows, Mr. Henderson should. Being most antique shops are closed at 8:00 PM on a Tuesday night, I did a quick tour of my wife’s family heirlooms and darned if he wasn’t right. All counteredbored. The man knows his nuts screws hardware. And the requisite pictures. 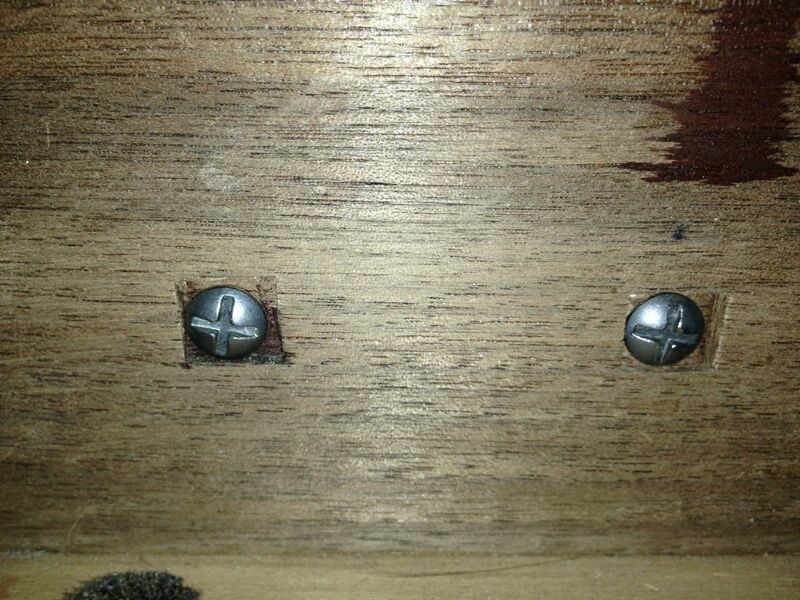 Screws may not be original. Let’s re-examine this picture from my last blog. 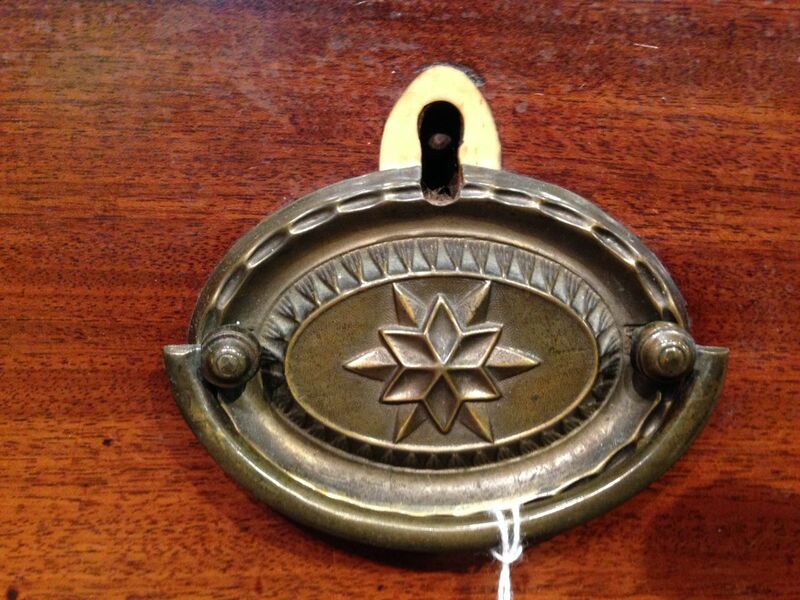 A really attractive pull with eye bolts. Click to enlarge. The auction house described this as: 19th century, flame mahogany veneers, single long drawer over two doors flanked by fully turned columns supported on later carved paw feet. Aside from the fact that there are two drawers, not one, let’s accept their description. I retrieved my copy of Classical Norfolk Furniture, 1810 to 1840 and started comparing pictures. This server is similar to pieces in the book. My initial impression was that this was a bit of a crude solution. But then it occurred to me that this is the inside of a drawer. The front of the inside of the drawer. Except for idiots such as the author (blogger? 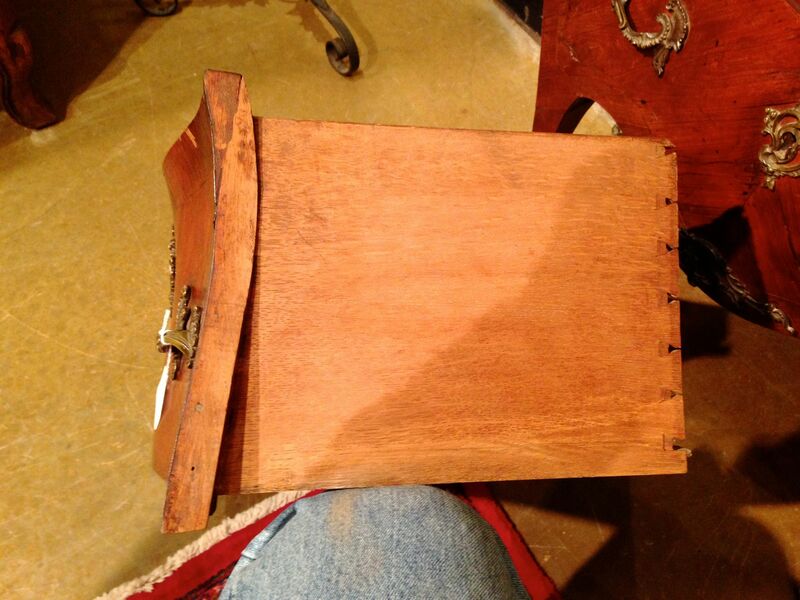 ), who the heck looks at the front of the inside of a drawer. 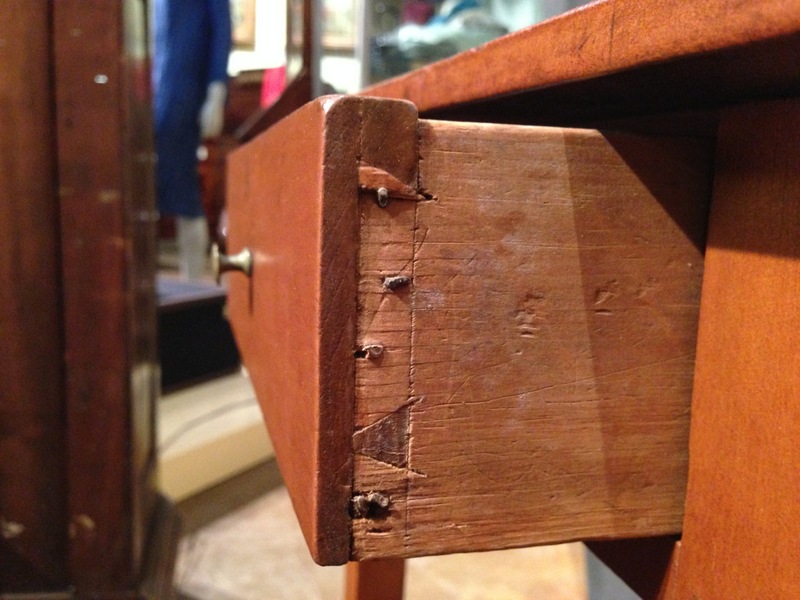 This takes us back to discussions of overcutting dovetails. Before Thos. Moser, there were different expectations of the perfection of furniture. More commerce and less art. So, you’re a furniture maker in 1830 finishing up a server for a client. You have this pull that the client selected or more likely left over from another job. 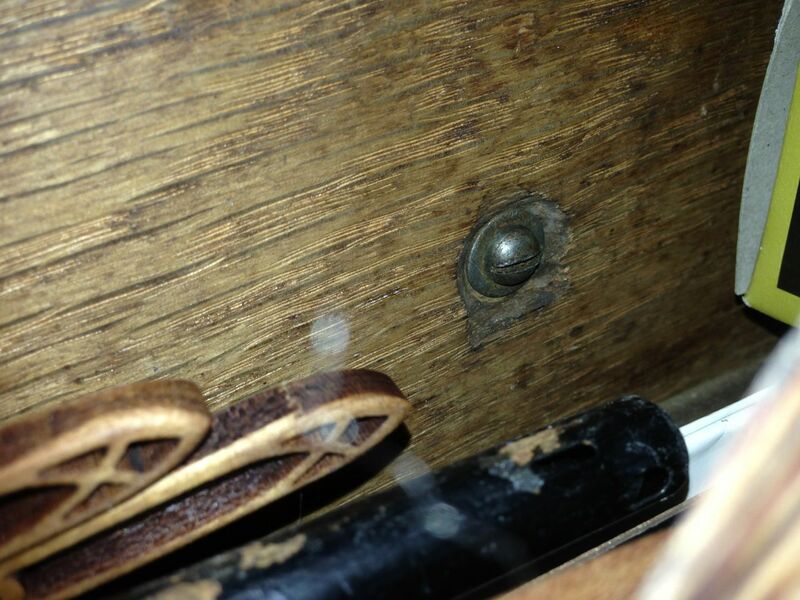 The pull has 1″ eye bolts that you have to mount on a 4″ drawer front. It’s not like you can order longer eye bolts from McMaster-Carr or e-mail Orion at Horton Brasses. You have to improvise (bodge). You can bore a hole with your brace and bit but, not having a nut driver, you can’t get your plyers (pliers) down a cylindrical hole. You need a conical hole. Out comes the ream or more likely, the chisel or gouge. A few minutes of banging and paring and you are that much closer to being paid. And it’s the bloody front of the inside of the drawer! And, there you have it. 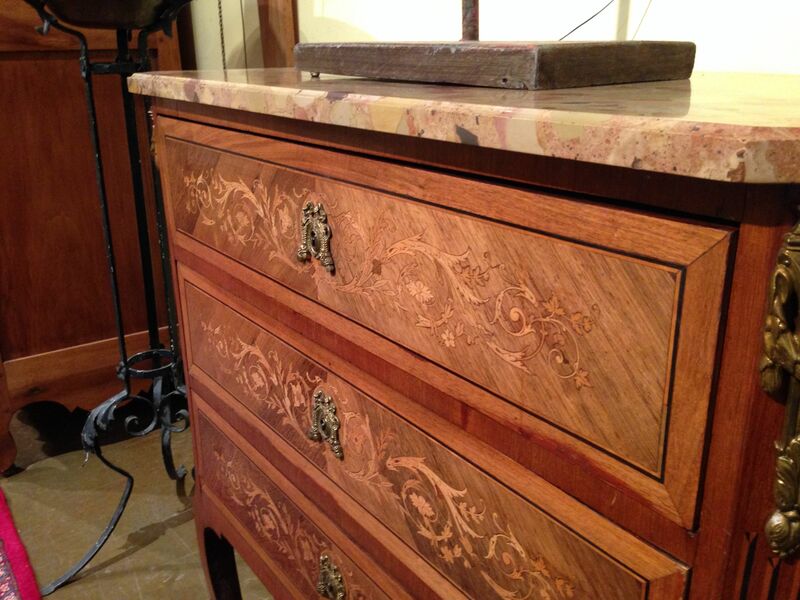 This ends today’s performance of Period Furniture Maker’s Theater. Hope you enjoyed. ‘night. Blog encore. This following has nothing to do with the rest of the blog. I just really like the column capitals on this server. Enjoy. Carved Norfolk Capital, or so they claim. Bodged, it’s not what you think. Language is not a static thing. Words can have multiple and evolving definitions with regional variations. Consider bodge, bodger, bodging, bodged. We can start with a bodger being an itinerant wood-turner that would travel in areas of England. They would set up near a village, purchase green lumber and turn chair parts on spring-pole lathes. Another definition is an incompetent mender of things. In the US it is also spelled botched, botcher, botching. A contemporary definition is people who make things using unconventional methods or materials. I found no corroboration but I think makers of steam punk could be considered bodgers. The definition of bodger I am pursuing in this post is a pragmatist that does what needs to be done. Coming up with a solution that may not be elegant but is certainly serviceable. Doing the best they can with what they have at hand. It might not be pretty but it’s also not horrendous. I have here a set of picture that shows the efforts of bodgers. Things didn’t quite go as planned, yet you come up with something that works and looks somewhere between fine and just a little odd. First one, what you do when you have to install an attractive pull on a chest with a really think drawer front? The pull is attached with relatively short eye bolts. This is the thick drawer front. Note the thin dovetail pins as discussed in a previous post. Click to see the elegant solution. I wonder if this was a solution widely used in production. The rest of these pictures are just examples of what you do when things just don’t work out the way you planned. It is a less than ideal situation but you can’t afford to throw it away and start over. It could be an error in measurement or given the hardware you have to work with, it’s just how it has to be. 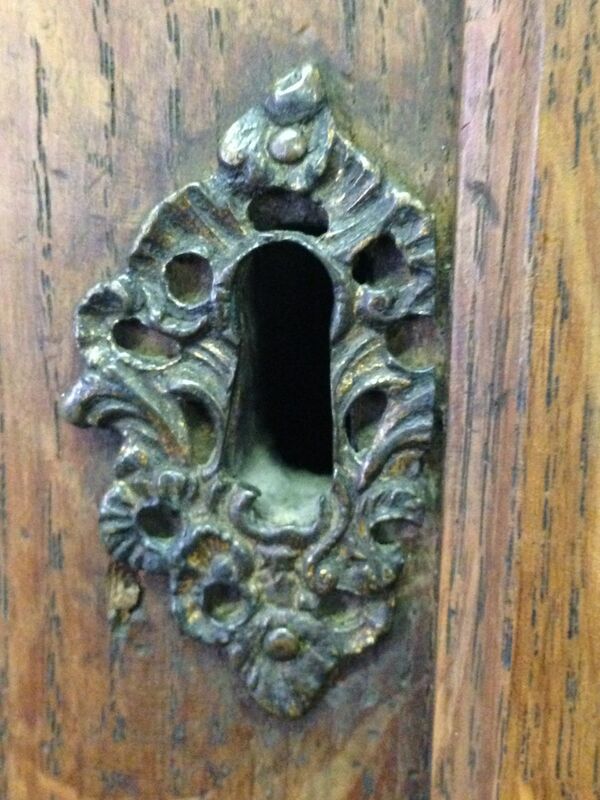 The lock goes here and the molding goes here. It’s all interesting stuff and not fatal. All I need is another quarter inch. This blog was inspired by a talk given by blacksmith Peter Ross at last weeks Triangle Woodworkers Assoc. meeting. Ever walked around your rich relatives new silk rug and notice the color and sheen seems to change as you circle. Or when mowing your grass, the left to right pass looks different from the right to left pass. Or vacuuming the rug. These are all manifestations of chatoyance. Chatoyance is caused by light being reflected differently by the variations in the reflecting surface. Grass leaning to the right reflects light differently than the same blade leaning to the left. When you vacuum a rug you change the direction of the nap. If you back brush velvet (or your cat), you change the way the fibers lie and change the appearance. Interesting, but what does that have to do with woodworking? Wood has grain, grain changes direction causing changes in appearance of the wood. 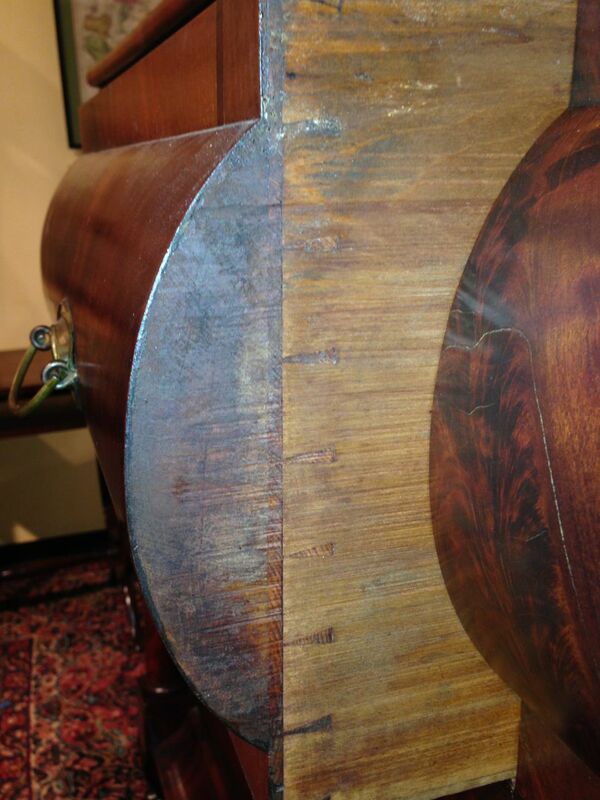 The look of highly figured wood is caused in part by the grain changing direction. Some of it may be due to the color variations but not all. Rockler has an article about chatoyance HERE. Chatoyance also explains why book matched veneers and resawn boards may look similar but not match exactly. When you resaw and flip a board, the grain that was rising at 5° on the left board is diving 5° on the right board. Walk around and the effect reverses. A fairly dramatic shift, don’t ya think. An interesting note. I went back Saturday morning to try to get better pictures. It wasn’t far out of the bank, landfill, Home Depot loop. 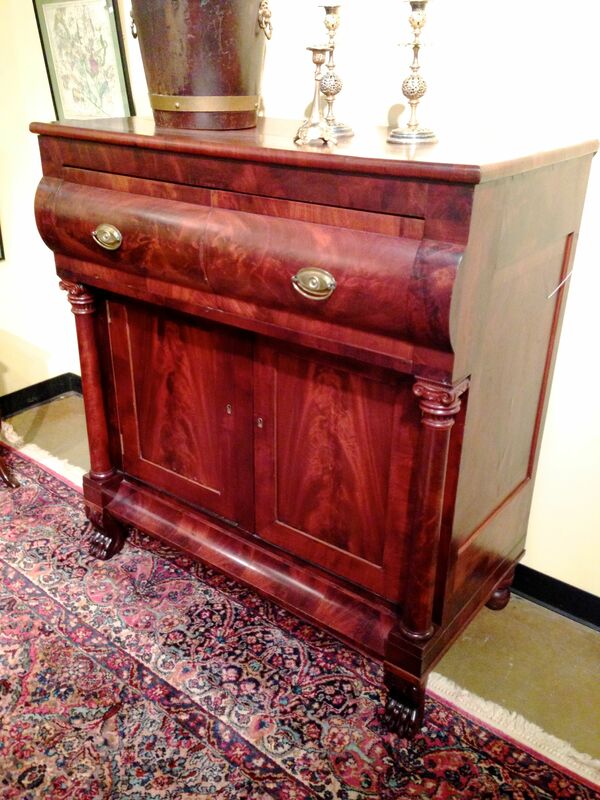 Turns out the auction started an hour early and this very chest was being auctioned. It sold for $400, a fair price but more than I am willing to pay for it. I will occasionally include a dovetail picture in the sets I post. 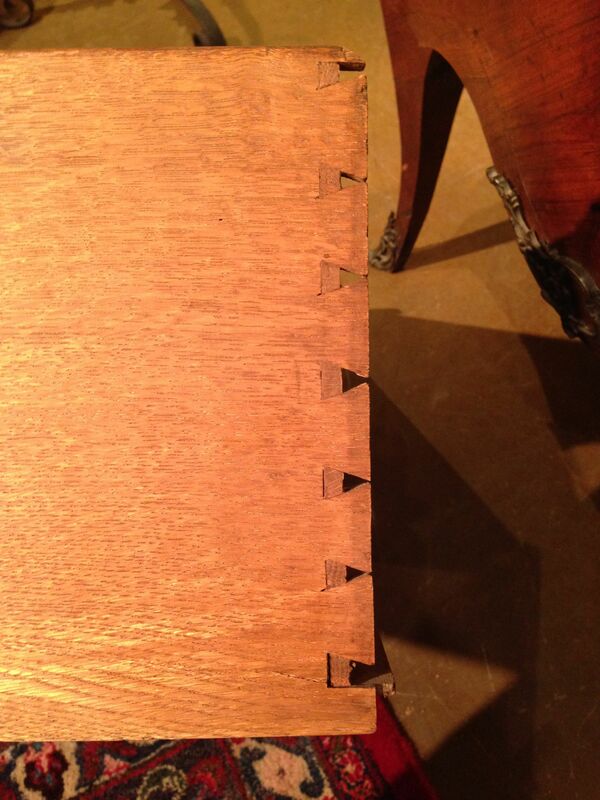 One reason I include these picture to demystify dovetails. I also use them to illustrate the craft of the furniture maker and show the secondary woods used. 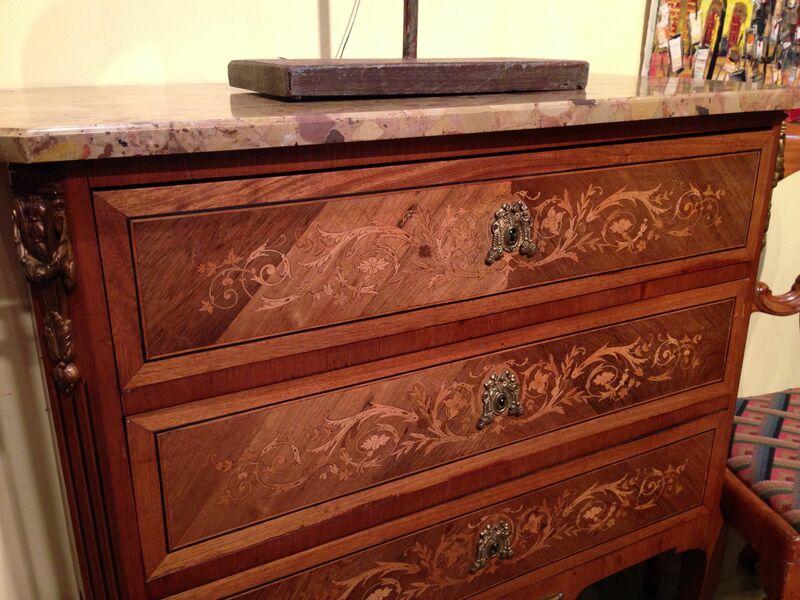 The most common dovetail I see is the half blind dovetail as seen in drawers. There are a lot of different ways to make a dovetail. The people making this furniture did what they did without the benefit of all the books and articles written in recent times. And to the best of my knowledge, most of them did so without the benefit of bloggers. Imagine. Much of what I have seen in the past few months has been dovetails with thin pins, you know, the ones that will never last and will shatter on impact. Or so conventional wisdom tells us. 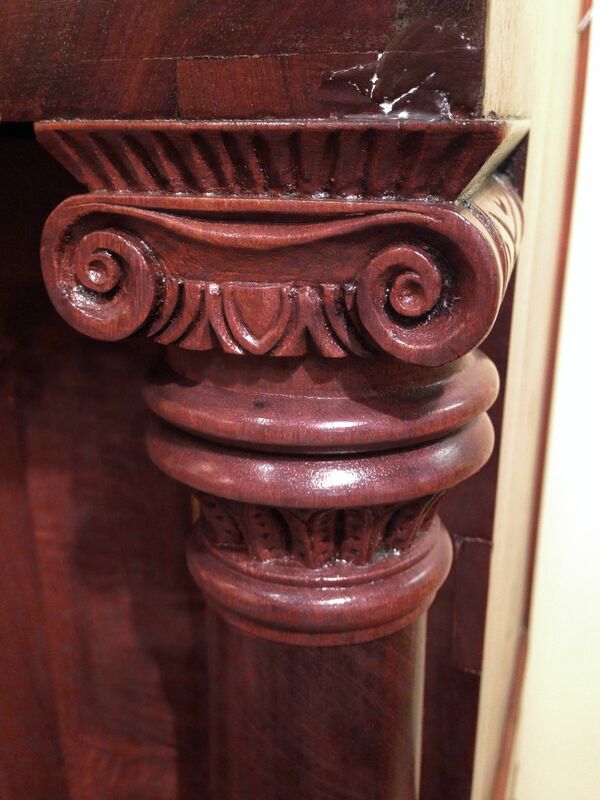 Most of what I photograph is Southern furniture, much of it built in the English tradition. The English seemed to prefer the thin pin. 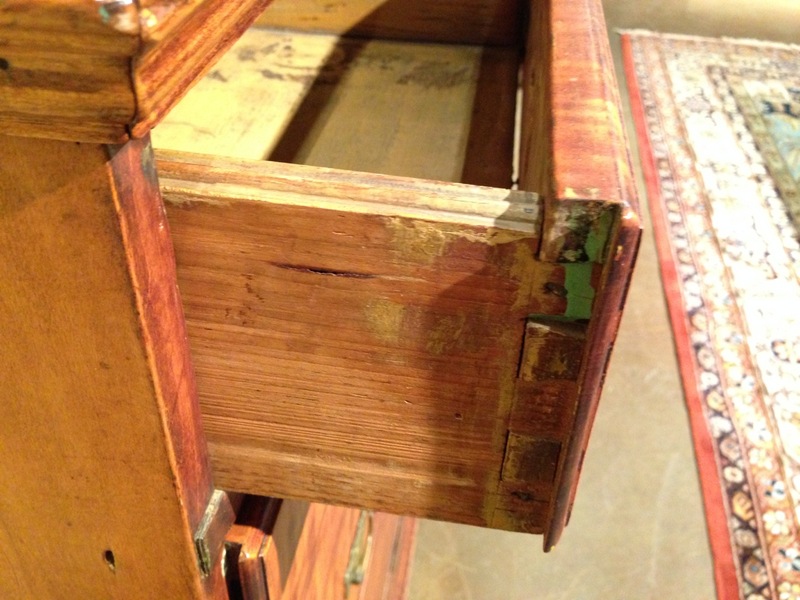 Exceptions are the clunky French country dovetails and the wedged German dovetails. What we need is a hero, someone who will defy convention and teach the one true pin. The aesthetically pleasing thin pin. There must be some Tom, Chuck or Harry that cares about bringing forward the traditional craft. A brave soul that will face the scorn and derision of his (or her) peers and do the right thing. Thin pins. Click to see a variety of thin pins. Just a quickie. Some might call it a nooner but it’s closer to 2:00 PM. And my second post today. In early January I had a blog entitled Behold the Lowly Gout Rocker. This is the gout stool for the other half or 1% depending on your politics. Found it in Charleston and it can be yours for a mere $3500. Order now. Quantities are limited. I have come to view antiques shops as uncurated museums. I not sure that any antiques dealer shares my view. My sense is that they expect to sell their antiques. I am not above spending money but I am at the point in my life where I need to get rid of something to bring in anything big. I don’t really need anything. Lust does rear its ugly head and I have been know to buy something small. It’s been 16 months since I bought something big. I am at the capture and release point in my antiques career. I look at an interesting piece, take a few pictures, put it back and move on. If I bought something every time I went out I could neither afford nor walk through my house. Museums have better lighting. They may be dark but they are usually evenly lit. Antiques shops have rows of bare bulb fluorescents, badly aimed spot lights, desk and floor lamps, big bright windows and dark unlit corners. Mixed lighting sources makes it difficult to color balance a set of pictures or even two pictures of the same piece. I do the best I can. 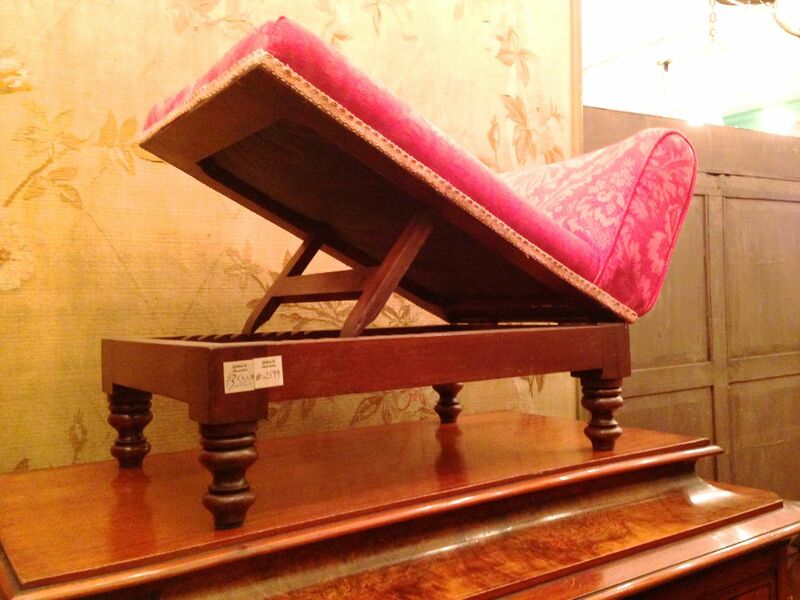 Museums don’t usually don’t stack furniture in their collections. They don’t pack their collections so tightly that you can’t walk between them. They don’t use the secretary to display linens, books. glassware and other chotskies. To be balanced, museums don’t let you open drawers and doors and rearrange their displays. They really don’t want you to touch their stuff. As I’ve said before, we live in an imperfect world. But you can’t do this in most museums. 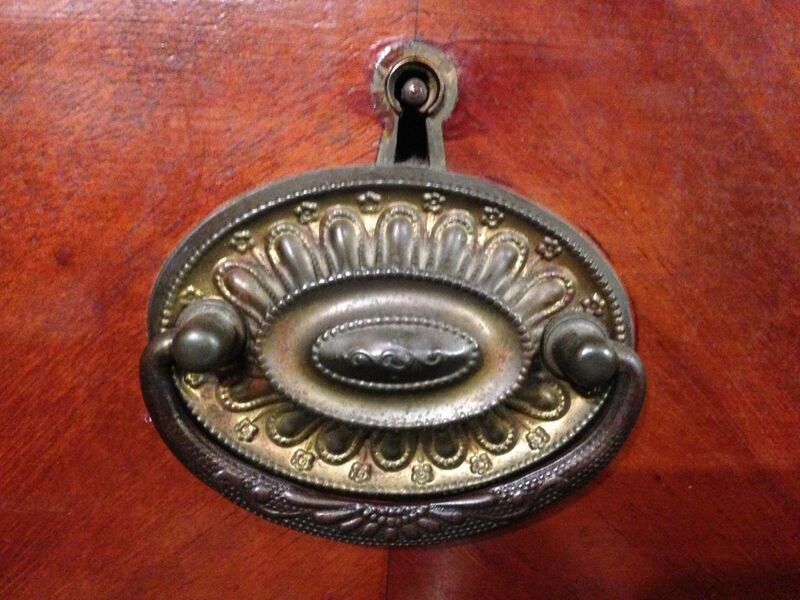 Today starts a few days of antiques in and around Charleston. This is a set of pictures from shops along King and Market Streets in the historic downtown area. High end stuff. Must be a high rent area. 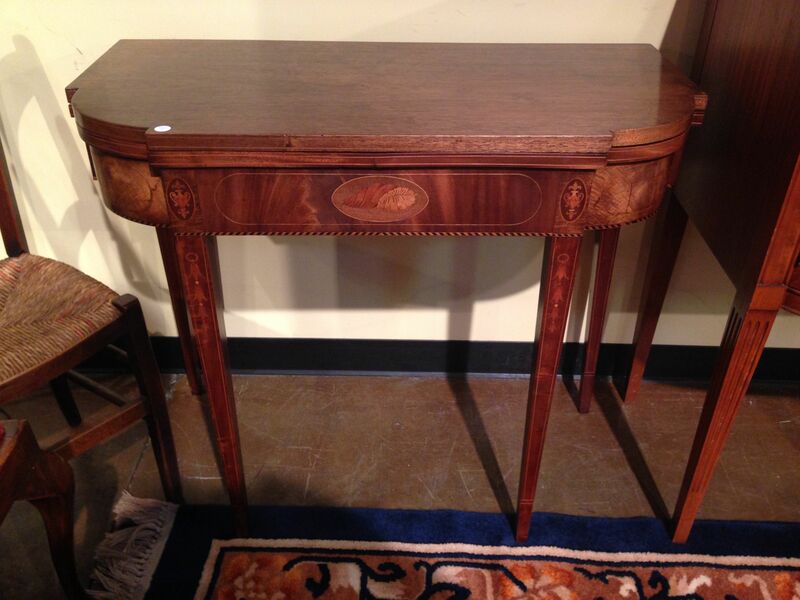 Click on this picture to see the full set of Charleston antiques.